As a working mother with two young children, Pattie struggled to find balance between her personal and professional life. Her career in healthcare management was overshadowing her ultimate goal…the ability to be a mom. It was during this time that Pattie decided to take a leap of faith and start working for herself. After researching several different franchise opportunities, Pattie decided to move forward in the childcare business, as it made the most sense with young kids at home. Her family ultimately decided on Kiddie Academy because of its philosophy and strong support from the corporate office. 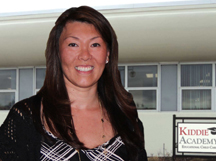 In 2012, Pattie opened her academy in Farmingdale, and she is already reaping the benefits of running her own business. Not only does her new career afford her more time with family, it has also provided the LaMarsh’s a comfortable lifestyle they never thought possible. The success of Pattie’s academy has far exceeded her expectations as a business owner, and its only just the beginning. Due to an overwhelming need for childcare in her community, Pattie expanded her academy by adding five additional classrooms. The expansion alleviated the ever-growing waiting list of children that were longing for the Kiddie Academy experience. Today, Pattie can rest easy knowing she’s capable of meeting her community’s needs while living a rewarding career. In 2013, Pattie received the Kiddie Academy® Annual Recognition Award for Community Leadership and in 2014 the academy received the Life Essentials®, Health and Fitness Pillar Award recognizing their excellence in delivering upon the values of the Kiddie Academy Health and Fitness curriculum and philosophy.